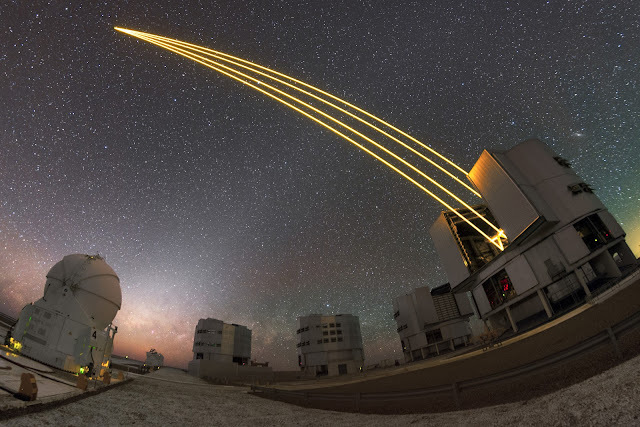 La Silla, Paranal, ALMA, APEX and soon the E-ELT, the European Southern Observatory (ESO) is the most active and productive astronomical observatory in the world. Settled under the amazing sky of Chile, ESO is using the most advanced technological systems for astronomy, like adaptive-optics based instruments: a field which makes ESO both pioneer and leader. Now, let us look at these state-of-the art observatories under a more scientific angle: what did they study in our Universe? What are the greatest discoveries made thanks to the European observatories in Chile? or what are the new faces the Universe has been given? Reams of ESO's discoveries actually revolutionized the world of astronomy. Among the ones we will mention in this article, you will undoubtedly recognize some of them! When in 1929 astronomer Edwin Hubble discovered that the Universe has been expanding since its creation, the idea that it could have been formed after a giant explosion was born. The theory is indeed the one we know as Big Bang, previously proposed by Georges Lemaître two years before. Until 1998, the hypothesis of a slowing expansion of the Universe was inherently the most logical explanation, since the giant masses contained within the galaxies would participate in slowing down the spreading out of our Universe with their gravitational force. All began in the 1990's, when a team of international astronomers decided to study some peculiar and intense astronomical phenomena: stars' end of life called supernovae. Two dedicated research programs were launched, in collaboration with ESO which belongs to the main investigators: the High Red Shift Supernovae Search and the Supernova Cosmology Project. 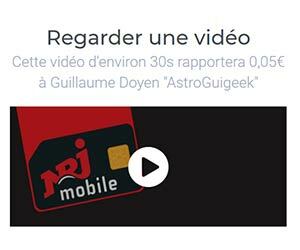 One type of supernova is making the astrophysicists fascinated about: 1a type supervoae whose evolution of their light emitted in respect to the time follows accurately a mathematical function, added with gentle statistical fluctuations. These supernovae can then be studied to measure distances in the Universe, with a serious precision. By using the 3.6-meter telescope and the New Technology Telescope (NTT) of La Silla Observatory and few other american telescopes, scientists did notice that the measured distances were actually higher than expected. In other words, the distances were higher considering a constant expansion of the Universe. This result, based on distance and red-shift measurements of 1a type supervovae proved in 1998 that the Universe was not undergoing a deceleration of its expansion caused by an attractive force but undergoes an acceleration of its expansion caused by a repulsive force. Such a major discovery enabled the confirmation of Einstein's 1917 theory dealing with the cosmological constant. This value contains unknown forces directly opposed to the gravitational force. Today, astronomers think that dark matter and dark energy which make up 80 % of the entire Universe are the main reasons of its expansion. One of the biggest challenges of the upcoming years will be to unveil and quantify the effects of these hypothetical dark matter and energy. The Milky Way is the galaxy in which the Earth, the Sun and all the visible stars in the night sky are located. The best region of our sky to study is the direction towards the galactic core, where the density of stars is the highest. Making astronomers curious, this region known as galactic bulge benefits from having an impressive visibility in the Southern hemisphere and more particularly from Chile where it reaches zenith (90° vertical angle). This is not a coincidence that the world's most powerful telescopes such ESO's are located in that place. In the 1990's, observation campaigns led using La Silla's New Technology Telescope (NTT) enabled the monitoring of a star cluster pretty close from the central black hole of the galaxy named Sagittarius A* (SgrA*). After ten years gathering data of the stars' trajectories (whose most of them were done with La Silla and Paranal telescopes), a scientific paper came out in 2002. Some astronomers stared at a specific star: S2 which features an elliptical orbit, likely influenced by a heavy celestial body: the hypothesis of a super-massive black hole of about 3.5 million solar masses became the most viable. More recent calculation made in 2009 improved the estimation of its mass to 4 million times the sun's. In may 2018, the very close approach to the outskirts of Sagittarius A* (namely less than 20 billions kilometers) enabled measuring its orbital speed to 25 million of kilometers per hour, which makes it to 3 % of the speed of light! On the one hand, this excess speed does not satisfy Newton's laws but on the other hand suits perfectly to the Einstein's theory of General Relativity. Such outcomes could not have been obtained without using the Very Large Telescope 's (VLT) Instruments: GRAVITY, SINFONI and NACO. On august 17th 2017, a collision between two neutron stars located at 130 million light years away released a gravitational wave towards interstellar space. This extremely rare event was detected by LIGO interferometer in the US. The European VISTA telescope from Paranal triggered its observation just few moments after and was one of the first ground-based telescopes to observe visible counterparts of gravitational waves! In total, 70 observatories with Europeans like the 2.2-meter La Silla, NTT, VLT and ALMA telescopes took part in this unique broadly-collaborated observation campaign, the biggest one in the history of modern astronomy. Gravitational waves are tiny space-time oscillations and must be caused by tremendously strong cataclysms in our Universe in order to be detected. One of them is the collision of neutron stars as the GW170817 shows by itself. 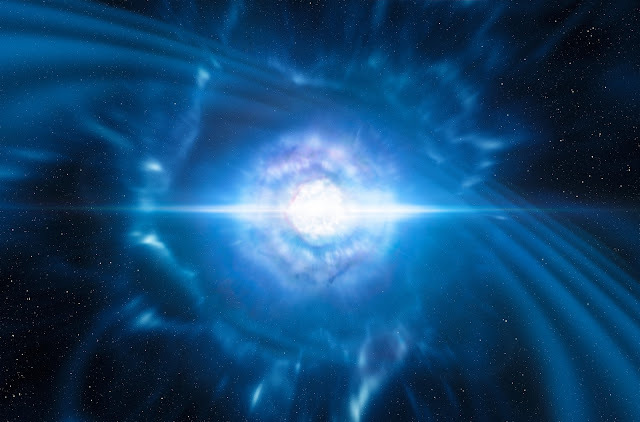 Moreover, this new GW discovery was simultaneously considered as the first observation ever of a kilonova, a stellar phenomenon only predicted by theory 30 years from now, whose explosion produces 1 000 times more energy than a common nova. Since the discovery of the first planet orbiting a Sun-like star outside of our Solar System in 1995, telescopes around the globe have been getting interests in seeking out worlds where life could proliferate. The majority of exoplanets discovered until now were found using indirect detection methods, on grounds of their low brightness and their narrow angular size compared to their mother star. On the other hand, the direct observation of exoplanets requires high-quality optics featuring a resolution pretty close to their theoretical limit. 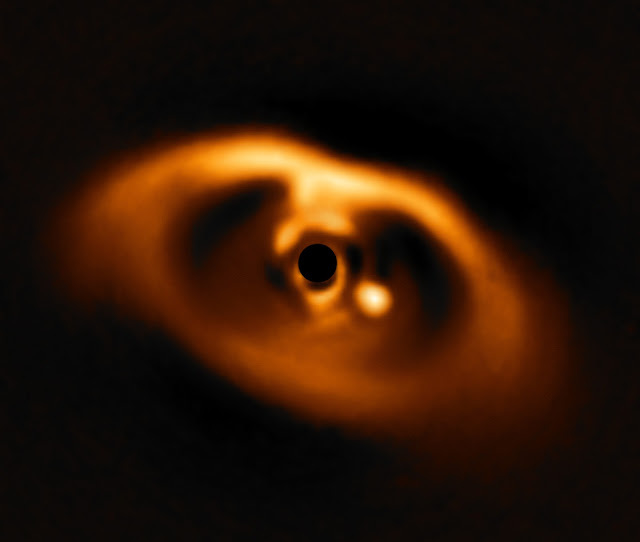 It was in 2005 that the first image of an external planet was made thanks to the Yepun telescope at VLT and more precisely with help of its scientific instrument NACO working with adaptive optics system. This instrument was developed under the supervision of the French Aerospace Lab (ONERA), the Laboratoire d'Astrophysique de Grenoble (LAOG) , the LESIA and GEPI labs of the Observatoire de Paris in France. Such a technology is able to provide diffraction-limited images of the sky by correcting atmospheric disturbances in real time. Here, it enabled to reach a mind-blowing resolution (FWHM) of 0.054 arcsec/pixel on the CONICA detector, designed by the Max Planck institute in Germany. PDS 70 star and its host planet being formed (bright point to the right). Credit : ESO/A. Müller et al. On July 2nd 2018, ESO announced that for the first time in astronomy, an image of a planet being formed within a planetary disc around a brown dwarf star has been captured. The star is named PDS 70 and its dust disc surrounding it, had been discovered few years earlier, in 2006. 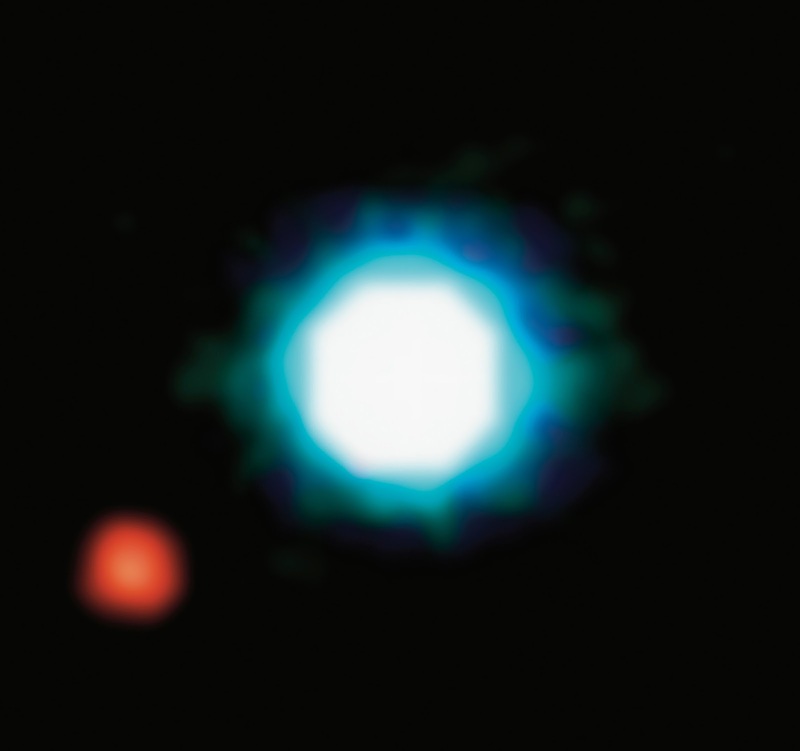 The bright point on the image shown here, corresponds to the young planet PDS 70b and was already discovered in 2012 with the VLT and its SHPERE instrument. However, no coherent outcome regarding the behavior of this anomaly was found. After 2012, this bright point faded out, remaining invisible to the VLT 's cameras. The idea that this object was hidden because it orbits PSD 70 star emerged. Further investigations were carried out in 2016 and 2017 and showed the object to be back again. These new observations were the most detailed ever obtained of this fascinating anomaly and the astronomers could prove the true nature of this object after analyzing its trajectory. PDS 70b is now known as a new-born planet interacting with its star's dust disc. SPHERE, the instrument that participated in this study, stands for Spectro-Polarimetric High-contrast Exoplanet REsearch instrument. 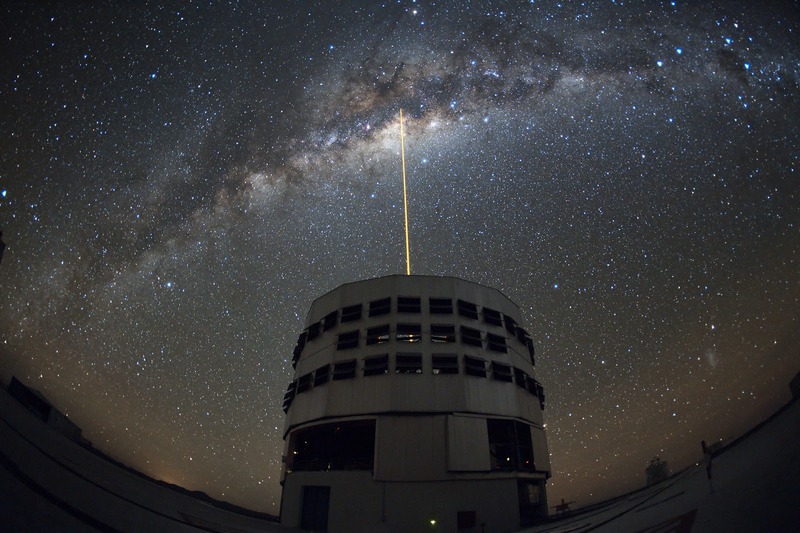 It is mounted on one of the four telescopes of the VLT, called UT 3 or Melipal. SPHERE uses a direct detection method for exoplanet which can be split in 3 key components: an adaptive optics system which consist on correcting the optical aberrations of the light caused by the disturbing layers of the atmosphere. It permits scientist to obtain the highest resolution as possible. A coronagraph whose purpose is to enhance the contrast and block the blind light coming from the star, around which faint planet-like objects are orbiting. Finally, a differential imagery system aiming at eliminating any light residual coming from the star, to collect exclusively the planet's light. Proxima Centauri, the closest star from the Earth has always fed the curiosity of astronomers. Distant of 4 light years only, it could be potentially a popular destination for future interstellar travel. After 15 years of research dedicated to the neighborhood of Proxima Centauri, instruments UVES on the VLT and HARPS on the 3.6-meter telescope at La Silla helped scientist to discover an exoplanet, 1.3 times heavier than the Earth. This historical discovery was officially announced on August 24th 2016. Not only this made Proxima b the closest extra-solar planet from our home but also the nearest potentially habitable neighbor since it orbits in a zone close enough from Proxima Centauri to enable the presence of liquid water on its surface. A larger scale telescope, such as the upcoming European Extremely Large Telescope (E-ELT) with its 39-meter-diameter primary mirror could unveil the truth as far as the life on Proxima b is concerned. ESO observatories are among the major actors of astronomical and astrophysical research of our 21st century. Next generation telescopes currently being built in Chile will definitely help us clearing out the strongest secrets of our Universe. Where could technological progress drive us?